Directions: From the Merritt Parkway, take exit 37, turn left taking Route 124 north toward New Canaan. Go about 9/10 mile and turn right on Farm Road. Go 1/10 mile and turn right into Saxe Middle School driveway. Connor Field is located down the hill, behind the maintenance garages on your left. The IF (infield field) is located closer to the Saxe School and the OF (outfield field) is the small practice field in the far right outfield corner. There cannot be a practice on the OF location while there is a game/practice going on at the IF location. Connor Field is home to the NCHS Freshman team and our Babe Ruth and Prep division teams. From the Merritt Parkway, take exit 37, turn left taking Route 124 north toward New Canaan. Go about 9/10 mile and turn right on Farm Road. Go 1/10 mile and turn right into Saxe Middle School driveway. Connor Field is located down the hill, behind the maintenance garages on your left. The IF (infield field) is located closer to the Saxe School and is sometimes referred to as the clay field and the OF (outfield field) is located further away from Saxe School and is a grass field to be used by the Bantam and Cub players for some games and practices. Connor Field IF is home to the NCHS Freshman team and our Babe Ruth and Prep division teams. When both Connor Fields are booked, the older team playing has priority on the IF field. When the teams are the same age, the website schedule is the determinant of field. Coming from the NORTH on the Merritt Parkway, take exit 37, turn left taking Route 124 north towards New Canaan. Go about 3/10 mile and turn left between stone pillars into Waveny Park. Go about 6/10 mile on the park road and turn right at the fork after the soccer fields following the signs to the Lapham Community Center, Waveny Fields, and Coppo Field. Joe Coppo Field can be seen on your right but travel about 4/10 mile from this point to the end of the road and park next to the Lapham community center. 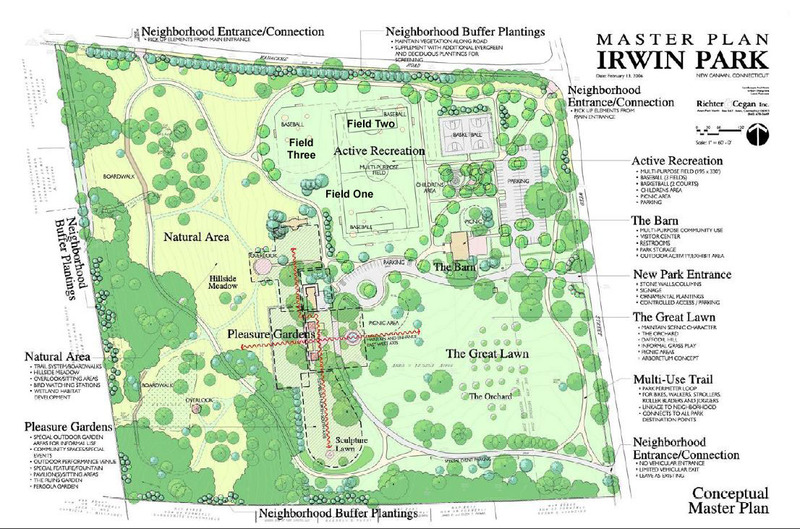 Fields are located behind the New Canaan Country School located at Frogtown Rd and Ponus Ridge Rd. From Frogtown Rd, enter the school on the side road located down the hill to the right of the main tree lined entrance. 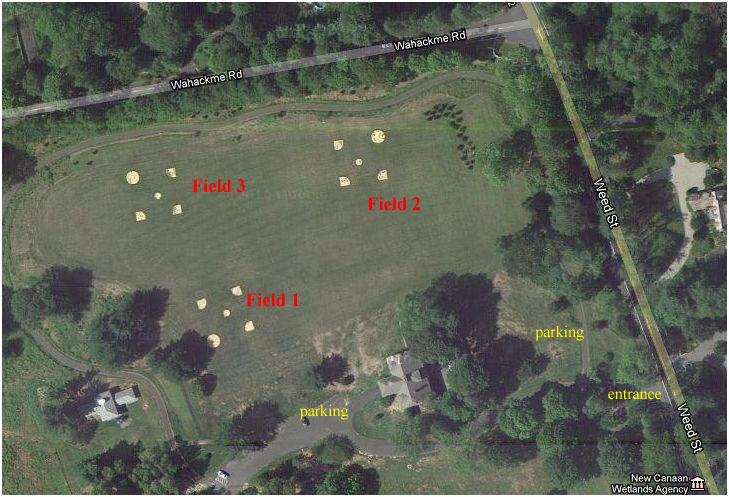 Field # 2 is located further away from the circle parking. Directions: Located near the corners of 106 and 123, the fields are directly behind the East Elementary School on Lttle Brook Rd. From the Merritt Parkway, exit 38, head north on 123. Take a right at the light onto Little Brook. The school is directly on the left. East Field #1 is the one on the right as you face the fields while in the parking lot. East Field #2 is the one on the left, further from the parking lot. Directions: From the Merritt Parkway exit 37, turn left taking Route 124 north towards New Canaan. Go about 1.7 miles and turn left on Mead Street. Go 1/10 mile to end of Mead Street and turn left on Park Street. Go 1/10 mile on Park Street. Mead Park is on your right. Gamble Field is the lighted "Cal Ripken" field located the farthest from the parking lot in the rear of the park. From Merritt Parkway, take exit 37 and head north toward New Canaan on South Avenue. Follow all the way to the end and take a left onto Elm Street. Follow to the end and take a left onto Weed Street. Go 1/2 mile and the Irwin Park entrance is on your left just before the intersection with Wahackme Rd. Field 1 is close to the parking. Field 2 is straight across. Field 3 is smaller and is in the back. These new fields are home to the Cub and Bantam divisions, with two full fields with 200 ft outfields and one smaller practice field. There are 3 backstops at Irwin Park that make up Irwin Fields 1-3. Irwin Field 4 will be a makeshift field in an open space with no backstop. From the Merritt Parkway, exit 37, turn left taking Route 124 north towards New Canaan. Go about 1.7 miles and turn left on Mead Street. Go 1/10 mile to the end of Mead Street and turn left on Park Street. Go 1/10 mile on Park Street. Mead Park entrance is on your right. Mead Field is the field directly on your left near the park entrance. It is home to the New Canaan Cannons, NCHS Varsity team and the Senior Babe Ruth and Babe Ruth teams. From the Merritt Parkway, exit 37, turn left taking Route 124 north towards New Canaan. Go about 1.7 miles and turn left on Mead Street. Go 1/10 mile to end of Mead Street and turn left on Park Street. Go 1/10 mile on Park Street. Mead Park is on your right. Skunk Hollow field is located in the center field of Mead Field, "the big diamond" near the batting cages. "Skunk" is a Bantam League field. Directions: From the Merritt Parkway, exit 37, turn left taking Route 124 north towards New Canaan. Go about 1.7 miles and turn left on Mead Street. Go 1/10 mile to the end of Mead Street and turn left on Park Street. Go 1/10 mile on Park Street. Mead Park entrance is on your right. Mellick Field is the lighted "Cal Ripken" field located closest to the rear parking lot. Mellick is home to the Major and Cub Divisions. Directions: From Merritt Parkway, take exit 37 and head north toward New Canaan. After passing YMCA on right, field will be immediately following on the right. Please park in the Saxe Middle School parking lot further up on the right and walk across the fields. Please do not use the YMCA parking lot. Parking on South Avenue on either side of the street is not allowed and tickets were issued last year. This field is 50/70 in size and is home to the Cal Ripken Major teams. From the Merritt Parkway, exit 37, turn left taking Route 124 north towards New Canaan. Go about 3/10 mile and turn left between stone pillars into Waveny Park. Go about 5/10 mile on the park road. 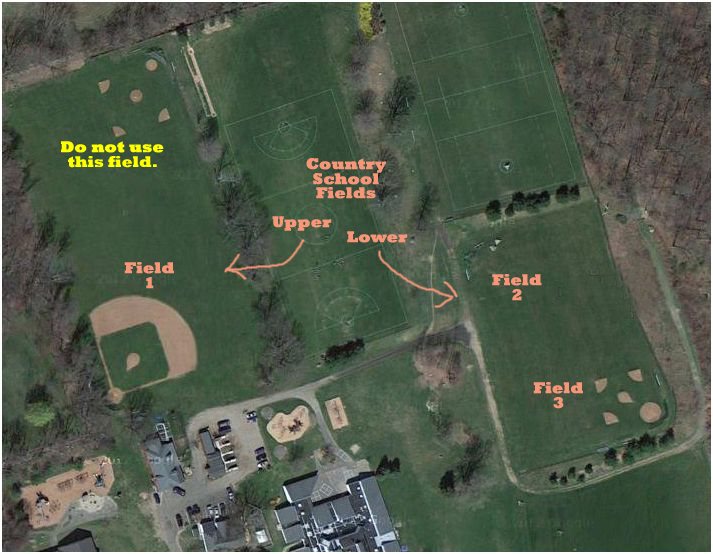 Waveny Varsity Softball Field (the "Orchard Field") is the first field you will see on your right. The field located past the Orchard Field's outfield and closest to the Water Tower is our Water Tower Field. Turn right into the parking lot. Waveny Water Tower Field is home to the Bambino, Minors and Majors Softball teams. From Merritt Parkway, exit 37, turn left taking Route 124 north towards New Canaan. Go about 3.10 mile and turn left between stone pillars into Waveny Park. Go about 5.10 mile on th eplark road. Turn right into the parking lot. Waveny Middle Field is stratight ahead to your left at the end of the parking lot. From the Merritt Parkway, exit 37, turn left taking Route 124 north towards New Canaan. Go about 3/10 mile and turn left between stone pillars into Waveny Park. Go about 5/10 mile on the park road. Waveny Varsity Softball Field (the "Orchard Field") is the first field you will see on your right. Turn right into the parking lot. Field is straight ahead to the right. Waveny Orchard Field is home to the senior softball teams and the Bambino, Minors and Majors Softball teams. Directions: From Merritt Parkway, take exit 36 and head north on 106. Go through the light and take the first left onto Weed Street. Head north and take a left at the stop sign onto Frogtown Road. Follow Frogtown Road to the end and take a left onto Ponus Ridge Road. West School is 1 1/2 miles ahead on your right. Please park in the circle in the back of the school and not in the circle in front of the school. The West School field is used for some Bantam games and practices.